When the green flag waves over the Great Railing 150 at New Jersey Motorsports Park, Orlandini will become the first Peruvian to make a start in the ARCA Racing Series. The 29-year-old from Lima, Peru, who goes by the nickname “Mono” (Spanish for “monkey”), will drive the No. 69 Gary Yeomans Ford Fusion for Kimmel Racing. It is a great honor to get my ARCA license and compete with Kimmel Racing in the series. Raul Orlandini is set to make history this coming weekend in the ARCA Racing Series presented by Menards. When the green flag waves over the Great Railing 150 at New Jersey Motorsports Park, Orlandini will become the first Peruvian to make a start in the ARCA Racing Series. The 29-year-old from Lima, Peru, who goes by the nickname “Mono” (Spanish for “monkey”), will drive the No. 69 Gary Yeomans Ford Fusion for Kimmel Racing. It was fellow Peru native Carlos Lira, dealer principal of Gary Yeomans Ford in Daytona Beach, Florida, that orchestrated Orlandini’s ride with Kimmel Racing. Carlos Lira, a veteran sports car racer himself, is the man behind a number of race operations based in Port Orange, Florida, including Lira Motorsports and Michael Lira Racing. His son, Michael Lira, is a driver in the ARCA Racing Series as well. Orlandini comes from a road course background on the Dakar Rally tour, so the road course at New Jersey Motorsports Park is the perfect track for him to launch his ARCA Racing Series career. 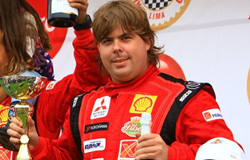 The Peru native is a three-time INCAS Rally winner, a two-time winner in the 6 Hours of Peru and a winner of the South America Rally Championship. He also finished second in the famous Qatar Rally. Since teaming up with Lira Motorsports and Kimmel Racing, Orlandini has gained some valuable oval track experience as well. He has tested at Mobile International Speedway and Talladega Superspeedway. The Great Railing 150 is scheduled to begin at 1:30 p.m. EDT, Sunday, June 1st. Two practice sessions will kick things off on Saturday, May 31 from 11:35 a.m. to 12:35 p.m. and from 1:25 p.m. to 2:55 p.m. Menards Pole Qualifying presented by Ansell is scheduled for 4:30 p.m. on Saturday. Be sure to follow Raul on Twitter at @MonoOrlandini and on Facebook at /RaulOrlandini.